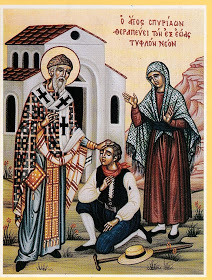 On the 13th of July the Orthodox Church celebrates the miracle of our Holy Father Spyridon the Wonderworker, who gave sight to the blind man Theodore. In 1577 the Venetians undertook a construction project outside of the fortifications of the city, which resulted in the demolition of the Church of Saint Spyridon in Koukounaria, which was near the Jewish cemetery and housed the incorrupt relics of the Saint for many years. No trace of this church exists today, yet it was in this church that St. Spyridon worked his first recorded miracle, giving sight to the blind man Theodore. For many years, whenever people passed by the area of this church, they would do their cross and speak of this miracle with astonishment. Konstantinos Tsagaras, hearing of this miracle and wanting to honor the Saint for working his wonder in his neighborhood, decided in 1700 to build a chapel to St. Spyridon in Sarokou. On July 13, 1735 this chapel was consecrated to commemorate the miracle of St. Spyridon healing the blind man.